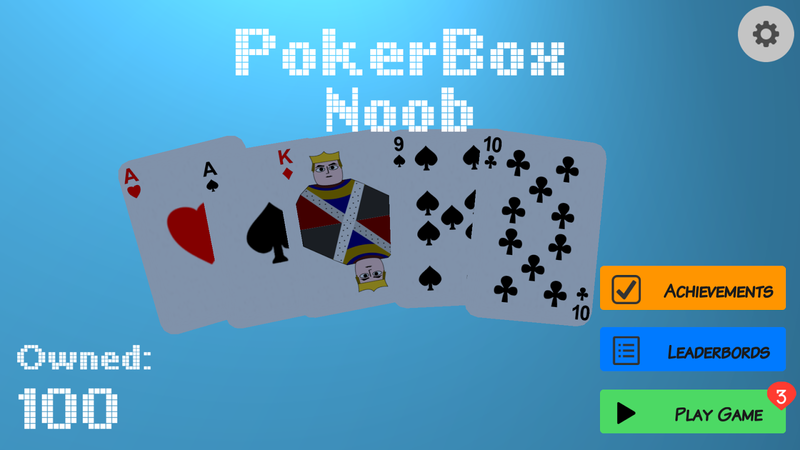 Before you go out and spend a lot of money playing real video pokeryou should consider training using PokerBox app. The app is totallyfree you do not have to pay for anything play video poker.Now youwill no longer be angry for loosing too much money playing videopoker. You can just enjoy the game stress free -- in the practicemode or you can compete with other players around the world to bethe first to unlock an achievement or to win the most virtualmoney(coins).Poker Box is a simple but addictive draw video pokerwhich simulates the games you found in casinos. There are two gamemodes:practice mode : the app can be used as a video pokertrainer.play mode: play the game with a limited amount of coins(exactly as in the real world). This mode is even more challengingas there are more global leader-boards available together with somerather unique achievements which make the game even moreenjoyable.Each day you play the game you will receive a small sumof coins as a reward, and there are also few optional actions whichoffer additional rewards.You can compete with your friends or withplayers from all over the world. Unique achievements and globalleader boards make the game more interesting.!!!! ImportantIf yournative language is not English or Romanian and you help usreview/adapt the string translations for you native language youwill receive a special swarm achievement which will remove all ads(and you will also be mentioned in our future Thanks section).Thismedal can also be obtained if you help us improve the applicationby Sending your constructive feedback from the suggestion sectionof the app.Brought to you by the same team (bgx interactive) whichhas developed Septica and Macao. Tarneeb - New Card Game prospectTarneeb was probably inspired by many other Arabic cardgames,though many different nations throughout the Middle Eastclaim thatTarneeb was created in their respective countries.HistoricallyTarneeb can be traced back to Bla'd Al Sham, morespecificallySyria, Lebanon, Jordan, and Palestine, however the gameseems tohave truly flourished only from the early 18th century on.The gameThe aim of tarneeb is to win a set of continuous hands. Therearefour players in partnerships of two teams. A standard 52 carddeckis used, each suit ranking in the usual way from Ace (high)down totwo (low). The game is played in a counterclockwise fashion.Theteams stay together for all the games of a set. Intarneebtournament, at the end of a set, the losing team is replacedforthe next set.The two members of each team are seated across each other,oftenon a table in such a way that no player can see the cards ofotherplayers (see seating charting image). Either player of a teammaycollect the winning tricks.The first dealer is chosen at random and after each hand theturnto deal passes to the right. The cards are shuffled and cut bytheplayer to the dealer's left, and are all dealt out beginningwithplayer to the dealer's right, one at a time or in groups ofthirteen(13), so that everyone has 13 cards.BiddingTarneeb seating arrangement.The bidding begins with the first player to the right ofthedealer and continues counter-clockwise. It consists of a numberoftricks seven or above. A bid of more tricks outranks any bidoffewer tricks.Each person can bid only once, eliminating the option foraplayer to raise their bid. In addition, the dealer, who bidslast,has the option to match, rather than raise the highestbid.Some players actually use the option of telling your partnerhowgood are you cards i.e., helpful, not helpful at all.PlayingThe objective of the bidding team is to take at least thenumberof tricks that they bid. The objective of the other team istohinder the declarer team from reaching their declared bid.The individual declarer leads to the first trick.Playerscounterclockwise must follow suit if they can; a player whohas nocards of the suit led can play any card. A trick is won bythehighest tarneeb (trump) in it, if any. If there are no tarneebsinthe trick, the highest card of the suit led wins it. The winnerofa trick leads to the next.Playing exceptionsIn some regions, the declarer must start the first trick withhisdeclared tarneeb suit. But in most cases they don't.ScoringOnce all thirteen tricks are played, the scores of the twosidesare calculated by adding the tricks each side has won. Ifthedeclarer team meets or exceed the number of bidded tricks,thenthey get the number of tricks they have, otherwise, they losethebid number (subtracted from their score) and the opposing teamgetsthe number of tricks they complete. It is possible, therefore,tohave a negative score at some point. The set ends when one oftheteams reaches thirty-one (31) and the losing team is replacedforthe next set.A team can win a game by bidding for 13 tricks, but they havetodeclare it at the bidding time by calling for a "game"(بالدق). Video Poker Slot Machine Emulator with possibility of doubling thewinnings Features: 1. Play 1 to 100 coins 2. Free play coins 3.Progressive jackpot 4. Bonuses 5. Top players Have a good time!